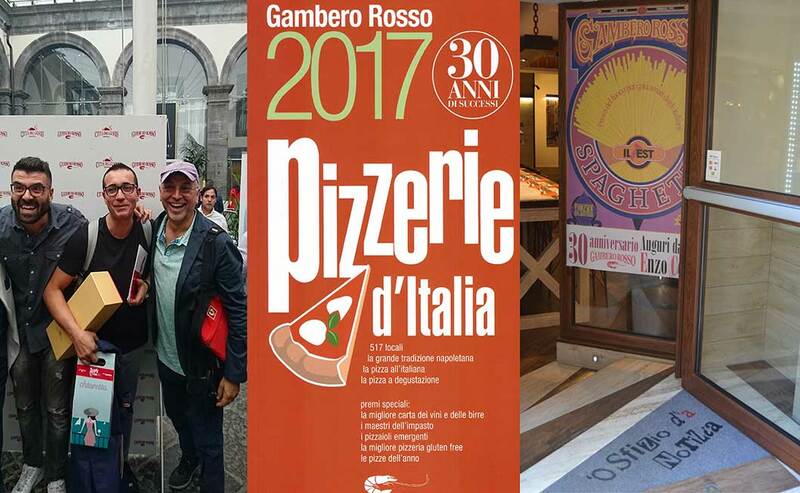 2017 edition of the Guide to “Pizzerie d’Italia” by Gambero Rosso, which was presented yesterday morning at Palazzo Caracciolo in Napoli, has awarded, this year also, “Tre Spicchi” (three slice) to Pizzaria La Notizia (the oldest one located in via Michelangelo da Caravaggio 53) and to the newest Pizzaria La Notizia (the one located in via Michelangelo da Caravaggio 94), for its unusual pizzas: an acknowledgment that I receive, every year, since 2013 when I was awarded for the best pizza dough too. And this year, I received also “Due Rotelle” (two wheels) for ‘O Sfizio d’a Notizia. A great satisfaction for me! For its thirty year anniversary, Gambero Rosso asked me to organize a dinner with one of the greatest Italian pizzaioli: Renato Bosco of pizzeria Saporè in San Martino Buon Albergo (Verona). Obviously, I was really delighted to arrange it and so, last night, at my latest place ‘O Sfizio d’’a NoTiZia, Renato and I do homage to the historical publishing house created by the journalist Stefano Bonilli – with whom I had the pleasure of working – which revolutionized the way of approaching food at all social levels, from the working-class to the middle-class, from the mass public to gourmet one. For the insiders, Gambero Rosso opened some vocational training schools which gave and are still giving birth to many young talents, promoting chefs and pizzaioli who are now at the top of the Italian restaurant industry in the world, from Cracco to Bottura, from Cannavacciuolo to Vissani, including me. A real hotbed for food artisans, today into the international cooking star system. I mean, who doesn’t know Gambero Rosso? Among the first to understand the importance of the pizza in the global cuisine, dedicating, already in 2007, a TV show “Tutti pazzi per la pizza” (Mad about pizza) presented by Giulio Golia with some important pizzaioli, even if still young, as Simone Padoan (pizzeria I Tigli in Veneto) and Gabriele Bonci (Pizzarium in Rome) and me, of course. And so, last night, while a poster of Gambero Rosso, January 1992 – the first issue of the monthly magazine (founded as a weekly supplement of Il Manifesto) – dominated on my place’s windows, Renato and I were indoors, intent on offering the very best to the customers, a menu that combined the traditional Neapolitan pizza with the Italian-style pie. I made the deep-fried pizza San Michele (with San Michele zucchini, lardo di colonnata and smoked buffalo mozzarella), the Cetara (a montanara with little piennolo cherry tomatoes and anchovies from Cetara) and the Bronte (a montanara with pesto from Bronte pistachio, buffalo mozzarella strips and mortadella cut into julienne strips). While Renato Bosco wanted to prepare the classic round pizza “Omaggio al Sud” and a Crunch of pizza, that is a pizza with double cooking, garnished with burrata from Puglia, speck “de ‘na olta”, figo Moro da Caneva and Sicilian pistachios. During these years, we’ve come a long way or rather we’ve made a lot of pizzas! Thank you Gambero!